The average soccer player runs 5 to 6.5 miles in a typical game, much of which is at a sprint that demands the heart work at 85 percent of its maximum rate. To perform her best under these conditions, a player needs to consume adequate calories regularly and to obtain them from the right proportion of nutrient-dense foods. Ask a physician or sports nutrition expert to help you develop a personalized diet that will enhance your soccer skills. According to Virginia Tech exercise science professor Jay Williams, a soccer player usually needs to consume 20 to 27 calories for every pound of body weight each day to replace the energy burned during practices and matches. This means that a 120-pound female player needs approximately 2,400 to 3,240 calories daily, while a 160-pound male player should have 3,200 to 4,320 calories per day. Elite soccer players may need more, while recreational, amateur players may require less. About 60 percent to 70 percent of a soccer player's total daily caloric intake should be supplied by carbohydrates, or roughly 4 grams of carbohydrates for every pound of a player's body weight daily, says Williams. Other sports nutrition experts recommend around 2 to 3 grams of carbohydrates per pound. On average, a 160-pound man following Williams' advice would need around 2,444 calories each day from carbohydrates, or 611 grams. A 120-pound woman would need approximately 1,833 calories supplied by about 458 grams of carbohydrates. These carbohydrates should come from a variety of low-fat, low-sugar sources such as whole grains, fruits, vegetables and unsweetened juices. Soccer players should not avoid fat, but they should focus on mono- and polyunsaturated sources like seafood, nuts and nut butters, olives, avocados and vegetable oils such as olive oil while avoiding trans fats from processed foods and saturated fat from butter, full-fat dairy and red meat. Williams advises getting at least 20 percent of your daily calories from healthy fats, but Nancy Clark, co-author of the "Food Guide for Soccer," says you should aim more toward 25 percent. A 160-pound man could have approximately 94 grams of fat daily, supplying 846 calories; a 120-pound woman could have about 70 grams of fat, which supplies 634 calories per day. 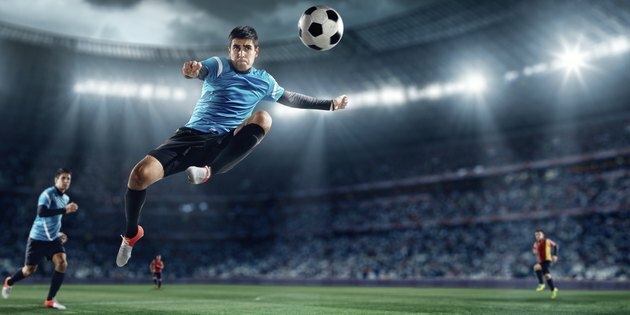 Protein should make up 10 percent of the typical soccer player's diet, or 0.5 to 0.8 gram of protein for each pound you weigh, according to Williams and a number of other sports nutrition experts. Male players weighing 160 pounds could have around 100 to 130 grams of protein totaling 400 to 520 calories daily, while a woman weighing 120 pounds should have an average of 282 calories from about 71 grams of protein. Pick skinless poultry, lean cuts of beef or pork, fish, shellfish, beans and legumes, nuts, seeds, soy products and low- or nonfat dairy such as yogurt, milk or cheese to fulfill your requirement. National Soccer Coaches Association of America: Calories, Carbs and Protein - What's a Player to Eat? Which Foods Should You Eat Before Playing Tennis?